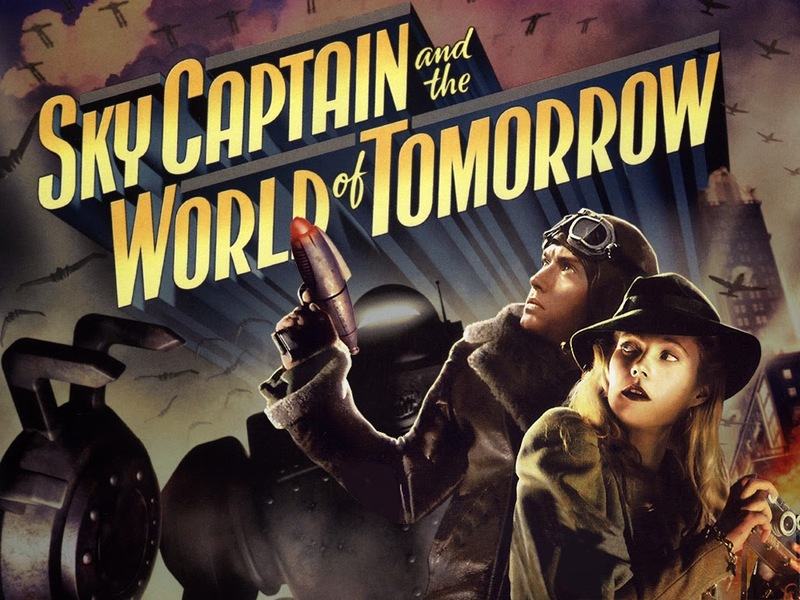 Sky Captain and the World of Tomorrow is a 2004 American science fiction action adventure film written and directed by Kerry Conran in his directorial debut. The film is set in an alternative 1939 and follows the adventures of Polly Perkins (Gwyneth Paltrow), a newspaper reporter, and Joseph "Joe" Sullivan (Jude Law), alias "Sky Captain", as they track down the mysterious Dr. Totenkopf (Laurence Olivier), who is seeking to build the "World of Tomorrow". The film is an example of the "dieselpunk" genre. Conran spent four years making a black and white teaser trailer with a bluescreen set up in his living room and using a Macintosh IIci personal computer. He was able to show it to producer Jon Avnet, who was so impressed that he spent two years working with the aspiring filmmaker on his screenplay. No major studio was interested in financing such an unusual film with a first-time director. Avnet convinced Aurelio De Laurentiis to finance Sky Captain without a distribution deal. Almost 100 digital artists, modelers, animators and compositors created the multi-layered 2D and 3D backgrounds for the live-action footage while the entire movie was sketched out via hand-drawn storyboards and then re-created as computer-generated 3D animatics. Ten months before Conran made the movie with his cast, he shot it entirely with stand-ins in Los Angeles and then created it in animatics so the actors had an idea of what the film would look like. Sky Captain is notable as one of the first major films (along with the earlier spring releases of 2004's Casshern and Immortal, and 2005's Sin City) to be shot entirely on a "digital backlot", blending live actors with computer-generated surroundings. In a technologically advanced 1939, the zeppelin Hindenburg III arrives in New York City, mooring atop the Empire State Building. Aboard the airship is Dr. Jorge Vargas (Julian Curry), a scientist who arranges for a package containing two vials to be delivered to a Dr. Walter Jennings (Trevor Baxter). Moments later, as the courier looks back while leaving with the vials, Dr. Vargas is nowhere to be seen. Polly Perkins (Gwyneth Paltrow), a newspaper reporter for The Chronicle, is looking into the disappearances of Vargas and five other renowned scientists. She receives a cryptic message telling her to go to Radio City Music Hall. Ignoring the warning of her editor, Mr. Paley (Michael Gambon), she meets Dr. Jennings during a showing of The Wizard of Oz. Dr Jennings tells Polly that Dr. Totenkopf is coming for him next. Suddenly, air raid sirens go off as giant, seemingly indestructible robots attack the city. Clearly outmatched, the police and other authorities call for "Sky Captain" Joe Sullivan (Jude Law). Joe commands a private air force based in New York State known as the Flying Legion. Polly shows little regard for her personal safety as she photographs the action from the street. Meanwhile, Sullivan engages the robots with his highly modified Curtiss P-40 pursuit fighter and eventually manages to disable one robot. The rest of the robots leave soon after. News reports show similar attacks around the globe. The disabled robot is taken back to the Legion's air base so that its science and technology expert, Dex (Giovanni Ribisi), can examine it. Polly follows, hoping to get information for her story. She and Joe are ex-lovers who broke up three years earlier in China, where Joe was serving with the Flying Tigers. Since it appears Polly has useful information, Joe reluctantly agrees to let her in on the investigation. Her lead takes them to the ransacked laboratory of Dr. Jennings, with the scientist himself near death. The mysterious female assailant (Bai Ling), escapes. Just before he dies, Jennings gives Polly the two vials from Vargas, and says they are crucial to Dr. Totenkopf's plans. Polly hides the vials and withholds the information from Joe. They return to the Legion's base just before comes under attack from squadrons of ornithopter drones. Dex manages to track the origin of the robot control signal, but is then captured. However, he leaves behind a part of a map marking the location of Totenkopf's base. Joe and Polly find Dex's map and fly to Nepal. Traveling into the Himalayas and Tibet, they discover an abandoned mining outpost and meet up with Joe's old friend Kaji (Omid Djalili). Two guides who turn out to be working for Totenkopf force Polly to turn over the vials and then lock her and Joe in a room full of explosives. The guides light fuses to the dynamite but Joe and Polly narrowly escape and are knocked unconscious by the explosion, which also destroys most of Polly's camera film. They wake up together in the mythical Shangri-La. The Tibetan-speaking monks there tell of Totenkopf's enslavement of their people, forcing them to work in the uranium mines. Most were killed by the radiation, but the final survivor (who was suffering from radiation poisoning) provides a clue to where Totenkopf is hiding. This leads them to another of Joe's ex-flames, Commander Franky Cook (Angelina Jolie), who commands a Royal Navy flying aircraft carrier with submarine aircraft. Franky leads the attack on Totenkopf's island lair while Joe and Polly enter through an underwater inlet. After surfacing, Polly notices that the reflection in the water of the identification number on Joe's aircraft reads "Polly" when viewed upside-down. Joe and Polly find themselves on an island with dinosaur-like creatures, which Polly hesitates to photograph as she has only two shots left on her camera. They head to a mountain and find a secret underground facility, where robots are loading animals, as well as the mysterious vials, onto a large "Noah's Ark" rocket. Joe and Polly are detected and nearly killed. Dex, piloting a flying barge, arrives in the nick of time with three of the missing scientists. Dex explains that Totenkopf has given up on humanity and seeks to start the world over again: the "World of Tomorrow". The vials are genetic material for a male and female human: a new Adam and Eve. As the group attempts to enter Totenkopf's lair, one scientist is incinerated by the defense system. A holograph of Totenkopf (Laurence Olivier) appears and speaks. Dex disables the defenses and the group discovers Totenkopf's mummified corpse inside with a scrap of paper reading "forgive me" still clutched in his hand. Totenkopf had died 20 years prior but his machines continued his plan. Joe decides to sabotage the rocket from the inside, sacrificing himself while the others escape. Polly tries to tag along, but Joe kisses her and then knocks her out. Polly recovers and follows Joe, arriving in time to save him from Dr. Jennings' mysterious female assassin, who turns out to be a robot. Joe and Polly then manage to board the rocket. Before the rocket reaches 100 km, when its second stage is scheduled to fire and thereby incinerate the Earth, Polly pushes an emergency button that ejects all the animals in escape pods. Joe tries to disable the rocket only to be interrupted by the same robot. He jolts the robot with its electric weapon and then uses it on the controls, disabling the rocket. They use the last pod to save themselves as the rocket safely explodes. Joe and Polly watch the animal pods splash down around their escape pod. Polly then uses the last shot on her camera to take a picture of Joe rather than the animal pods. Joe grins and says: "Polly—lens cap."